This is another favorite place of mine, as it is full of lush vegetation, waterfalls, caves, and spectacular rock formations. 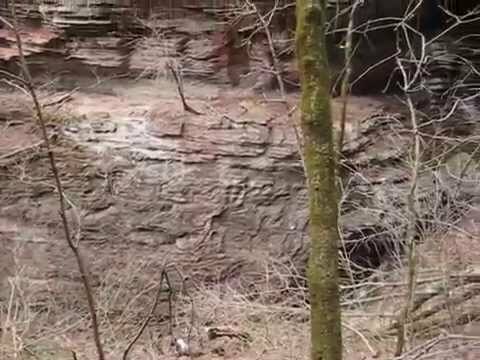 This area of Indian Creek is also one of the most dangerous and according to the National Park Service, this area has more reported injuries from slips and falls, than any other area in the Buffalo National River. I prefer to travel from Kyles Landing up Indian Creek along a primitive trail. Depending on the water level, one might be able to follow the Indian Creek or have to take an upper route along a ledge with a steap dropff. Along the way, you will have a couple creek crossings and see numrous rock formations, waterfalls and eventually you will come to Arkansas Cave, which has a waterfall coming out of it. As you go past the cave, you have to scale a rock wall and climb to an area I call “The Shelter”. From there, you crouch through a hole in the bluff an come out the other side. You continue to follow Indian Creek, until you reach “The Eye of the Needle”, which is a spectacular rock formation, which depending upon the time of year, may support a nice waterfall running down through the eye. While this area is indeed one of the most scenic in the Buffalo National River, caution should be used and professional guide services might be suitable. Located off Arkansas Highway 74 in the heart of Mount Sherman between Ponca and Jasper. Shares entrance with Boy Scout Camp Orr.